John MacLeod brings great effort every week! He hasn’t missed a game all season. Tonight he took a hard shot and bounced right back with a huge catch and throw to help his team to victory! He told me after the game that it was nothing compared to his dodgeball days with the old red rubber balls wizzing around! John is a great player and loves to compete, he’s also always honest and having a good time. His patented jump split is something to behold! See ya next week for playoffs! Katy krenabach laced up the sneakers tonight and put on a show. Her patented jump, split dodge is something truly magical! She is often the last one standing and ready to make catches to bring her team back. POTG on courts 1 and 2 tonight! She would not be denied in her second game. Rallying her team in a close 4-3 win over Duck Duck Chucks victory. Great games tonight Katy - can’t wait to see you on the court next week! Dodgeball can be a game that can get very competitive, very quickly. 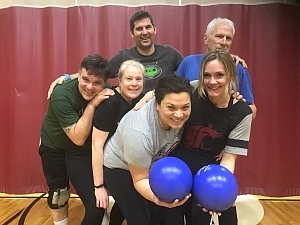 On Wednesday night AARP and Mediocre Athletes displayed what it looks like to play competitively, but also have a ton of fun. Both of these teams were cheering for their own team, but also encouraging the opposing team. At the end of the game each team had many smiles on their faces and laughs to go around. This is the true Underdog spirit that we try to cultivate! Nice work AARP and Mediocre Athletes!